Alvarez is one of those brands that knows how to make a value product perform great, but also look good. 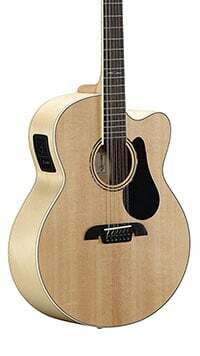 Their AlvarezAJ80CE­12 is considered to be one of the best 12 string acoustic guitars out there exactly for this reason. Today we are going to take a closer look. One thing that will draw your attention as soon as you see this guitar is its finish. There is something about a blonde natural gloss over a solid sitka spruce top and maple shell. You don’t see it too often, but it definitely makes a statement. Alvarez went ahead and finished that stylish design with pearl binding all around, as well as a pretty attractive rosette. Neck is a mahogany piece that also features binding around its rosewood fretboard. If we were to judge guitars solely based on looks, this Alvarez would be at the very top of our recommended list. It’s an extremely attractive guitar. However, build quality is what matters the most. Fortunately for us Alvarez did an awesome job with both fit and finish, as well as internal bracing. Alvarez AJ80CE­12 is ready for serious stage work and it won’t let you down in any regard. In terms of hardware, we have more or less the standard setup. Bridge is a compact rosewood piece which has raised a few eyebrows when we first saw it. Usually with 12 string guitars you have beefier bridges due to the increased number of strings and thus increased tension. However, this simplistic bridge is more than capable of handling whatever abuse you send its way. Tuning machines come in form of premium die cast units that track incredibly well and are fairly precise for the money. The only real place where you might find Alvarez AJ80CE­12 to be lacking are the nut and saddle. Alvarez used PPS synthetic bone instead of more common Tusq or actual bone. However, PPS works just fine for the purposes of this particular model. L.R. Baggs pickup and preamp set more than makes up for this superficial downside. More on that later. The sound you can expect from Alvarez AJ80CE­12 is quite something. First of all, we have a jumbo body shape that is paired with a real high quality sitka spruce solid top. That gives you the traditional warmth and range. Then there’s the maple shell which adds a bit of a punch, especially in the mid range. The guitar sounds well balanced with plenty of definition. You will hear every little overtone even if you play more complex chords. When it comes to the on board set of electronics, L.R. Baggs has delivered once again. The model they have selected for this guitar features a three band EQ as well as a built in tuner. Even at default, or flat settings, Alvarez AJ80CE­12 sounds great through an amp. You really get a good platform you can later use to build the sound you truly want. Even though this guitar isn’t a hand made piece nor an overly expensive one, Alvarez AJ80CE­12 has proven to be a rock solid choice. It performs when you need it to, has all the features we want to see in a modern 12 string acoustic, and it is highly reliable. 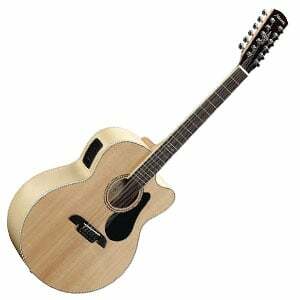 For more info about the Alvarez AJ80CE­12, click here.